Source: JobsEQ, Chmura Economic and Analytics, 3rd quarter 2017. U.S. Bureau of Labor Statistics, Quarterly Census of Employment and Wages. Includes all jobs located in the Richmond Regional Planning District Commission footprint. 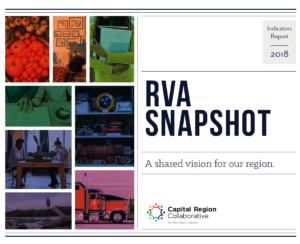 This indicator shows industry diversification within the Richmond Region economy. Having a diversified economy spread out over many sectors can help insulate a local economy from structural shifts in the national economy. The Richmond Region has the biggest competitive advantage nationally in financial and management industries.